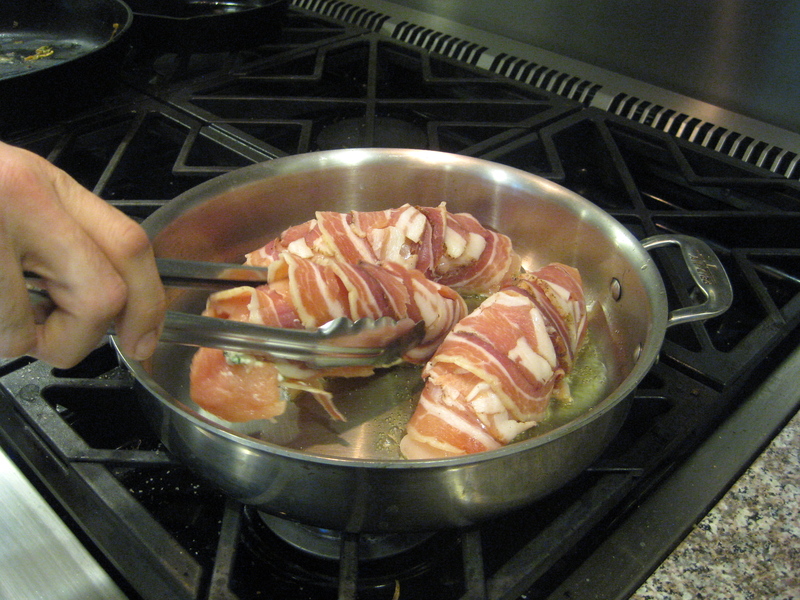 Pancetta wrapped chicken breasts. It can be tricky to cut thin slices of pancetta suitable for wrapping the meat. I would love to have a slicer for this. My wife doesn't understand why we need a slicer. I asked her to cut the pancetta for this recipe. Now we will see who wants the slicer. Almost every week, we have chicken for dinner at least once. It is an easy choice for weeknight meals because it cooks up fast. Last week I got a little fancy: I pounded the chicken breasts flat, stuffed them with goat cheese and fresh herbs from the garden, wrapped them in pancetta from Parma Sausage in the Strip, and cooked them up on the stovetop. It was good. My only complaint is that the pancetta is a little too salty. It has a great flavor overall, but next time I use it I might soak it first. Anyway, you might ask me what the babies ate for dinner that night. They ate the same thing, of course! No chicken nuggets here. 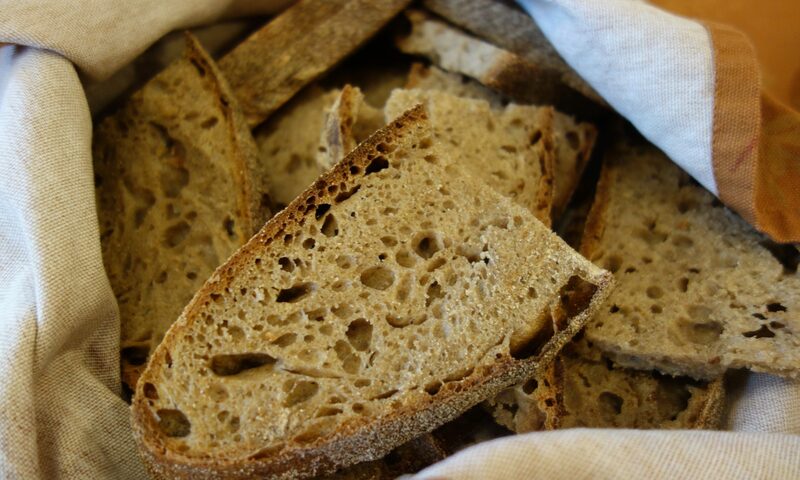 Some people are surprised that our daughters eat grownup food, dishes with flavor and texture. Is it because we don’t offer them “kid food” like chicken nuggets, or simply their natural tendency? I don’t know the answer. I just enjoy sitting down to a meal with my family at the end of the day, sharing the same food together. It is very important to me. Recently we finished reading Pamela Druckerman‘s “Bringing Up Bébé,” a book that talks about different approaches to parenting in America and France. Everybody is reading this book. Among other things, it talks about picky eating. Americans might tend to see it as the child’s individuality, just personal choice. French parents would think the child is missing an important experience by not learning to appreciate that food. French parents would probably think chicken nuggets are child abuse! I am not sure what the author would think of Spanish culture, but I remember having meals with multiple courses and eating the same foods as adults. My friends Rob and Sarah told me that their first son ate everything from goose liver to artichokes–before kindergarden. Once he was in kindergarden, he only wanted pizza and nuggets. Peer pressure! 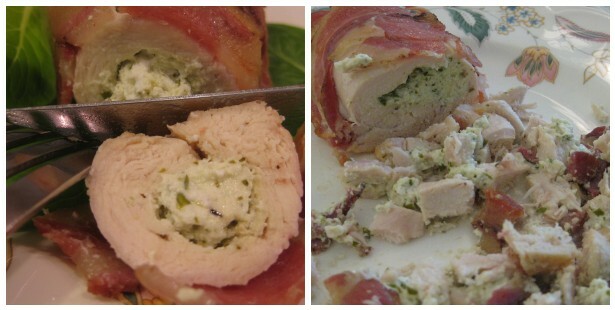 Goat-cheese stuffed chicken breast wrapped in pancetta. On the left, the "grownup" preparation, and on the right, the "baby food" preparation!